Laid down, 20 July 1944, as a Maritime Commission type (VC2-S-AP2) hull, under Maritime Commission contract (MCV hull 540) at Permanente Metals Corp., Yard No.1, Richmond, CA. Decommissioned, 29 March 1946, at San Francisco, CA. General Agency Agreement Isthmian SS. Co., 8 February 1947, at Baltimore, MD. Laid up, 20 October 1947, in the National Defense Reserve Fleet James River Group, Lee Hall, VA.
General Agency Agreement Alaska SS Co., 24 January 1952, Seattle, WA. Laid up, 5 May 1962, in the National Defense Reserve Fleet, Olympia, WA. Merchant Service Isthmian SS Corp.
206k Ex-USS Bedford Victory (AK-231) in merchant service as the Isthmian SS. 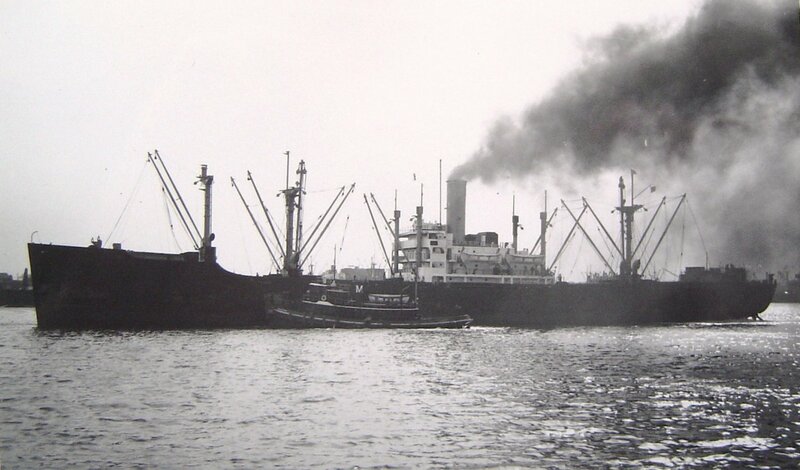 Co. Inc. cargo ship SS Bedford Victory in New York harbor, circa 1947, she wears the yellow smokestack of the Isthmian SS. Co. Inc.